World War II German aviation research and engineering contributed significantly to the state of the art of flight. While Whittle developed the centrifugal flow jet engine that would later power the Meteor and (ironically) the MiG-15, it was the Germans that developed axial flow jet engines that not only powered the Me 262, but also would become the basis for modern turbojet engines and the core for modern turbofans as well. One such leap in technology was the work of the Horten brothers, Walter, Reiner and Wolfram. As teenagers, they developed all-wing gliders and understood the unique aerodynamic requirements for their control. Since Walter was a fighter pilot, he understood that it would take a superior machine to defeat the Spitfire. The result of their work was the Ho 9. First flight of the aircraft came in late 1944 as the aircraft was originally designed to be powered by the BMW003 engines. When the Jumo004 engines came in their place, these were significantly larger and necessitated a major redesign to accommodate the new engines. 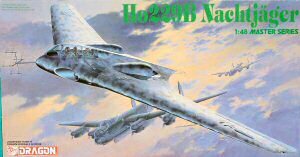 Nevertheless, the design was a success and was accepted into production with some changes as the Ho 229. Six prototypes were scheduled for initial production and the first, the day-fighter variant, was about ready for its first flight when the US Army overran the Gotha workshop in April 1945. 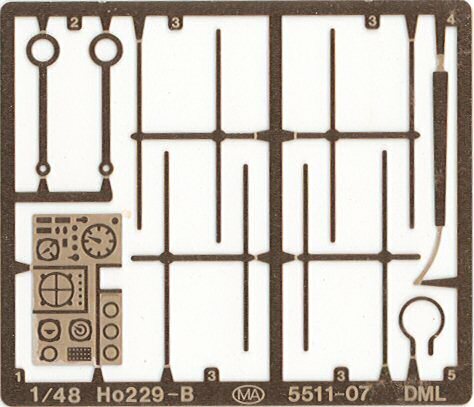 Here is DML's Luft '46 release of their very popular Ho 229A kit (reviewed here). While the first release was borderline Luft '46, one sole example survived the war and is on display at the Smithsonian Institution's new Air and Space Museum annex at Dulles International Airport. DML took the concept to its next logical step, a two-seat Nachtjäger that is armed with four of the Luftwaffe's early air-to-air guided missiles. How truly effective these first missiles would have been in combat remains to be seen as they were guided by the backseater since viable seeker heads were still another decade away. 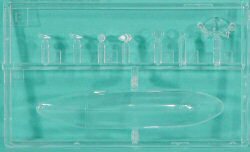 Like the first release, this kit is molded in light gray styrene and is presented on six parts trees, plus one tree of clear parts and one fret of photo-etch. The molding is crisp and the details are scribed. 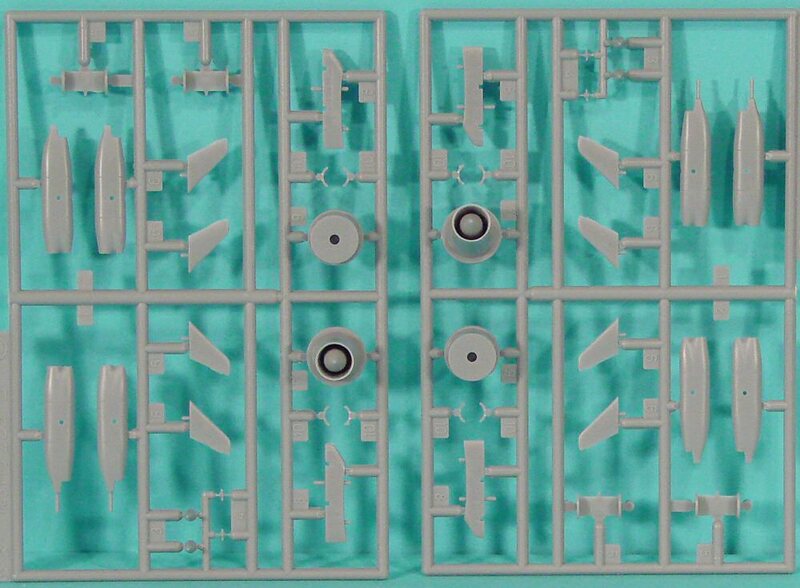 The first thing you'll notice is the change of parts layout in this kit. The fuselage is simplified as the engine access panels are no longer molded separately, so the engines themselves are no longer provided. 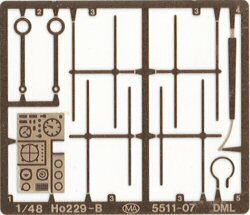 Likewise, the wings are not intended to be removable as they were in the Ho 229A release, so the internal framework detail is also deleted from this kit. 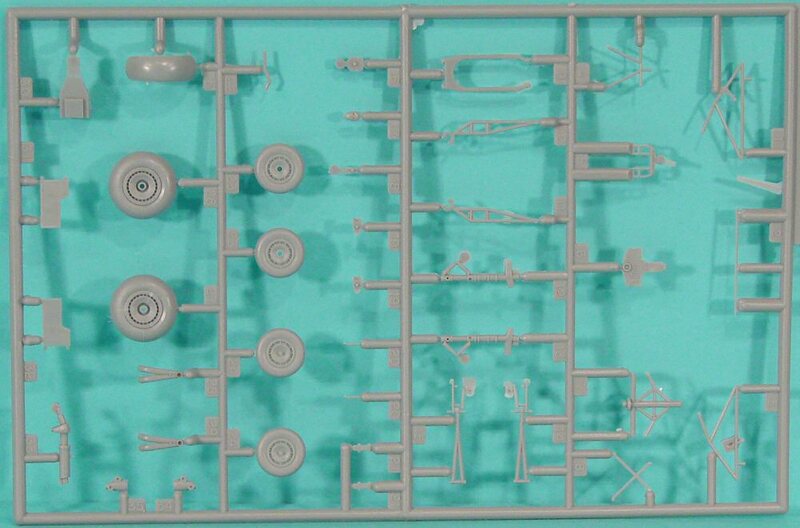 What is new in this kit is the rear cockpit, longer canopy, radar antennae (in photo-etch) and four Henschel Hs 298 air-to-air missiles and their underwing pylons. You can always find a set of Ruhrstahl/Kramer X-4 missiles instead. 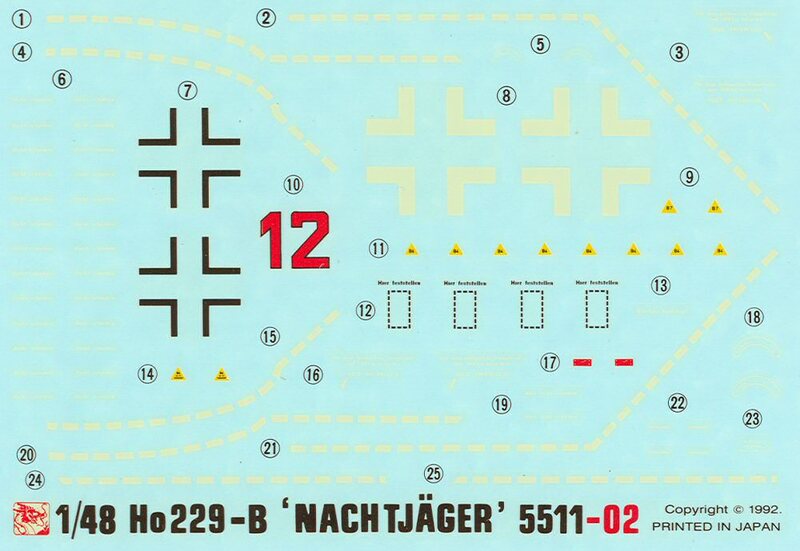 According to the data block on the instruction sheet, the Ho 229B could be armed with four Mk.108 30mm cannons or four air-to-air missiles. Given the extra weight of the radar set and second crewmember, it would make sense to limit the weight of the armament to an 'either/or' rather than lug both into the air on the limited thrust of those early Jumo engines. As with the earlier kit, this release still offers nicely detailed cockpit details with two ejection seats, the same front instrument panel, and a new photo-etched rear panel. 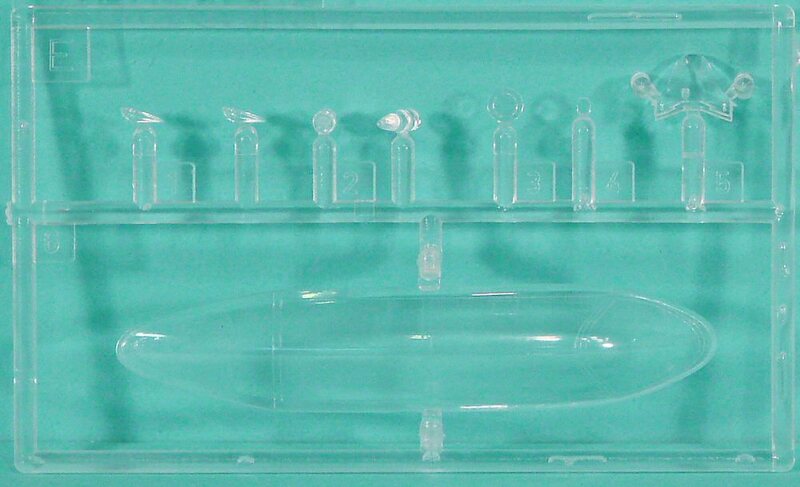 The kit also retains the earlier release's nice landing gear detail. 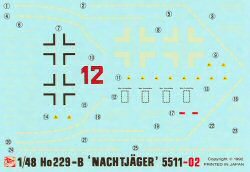 Markings are provided for a notional Red 12 night fighter. The instructions are nicely illustrated and clearly show the colors for all of the parts using Gunze Sangyo color numbers, though a table is included to translate those colors into generic color names. This kit has been reissued a few times but is currently out of production. 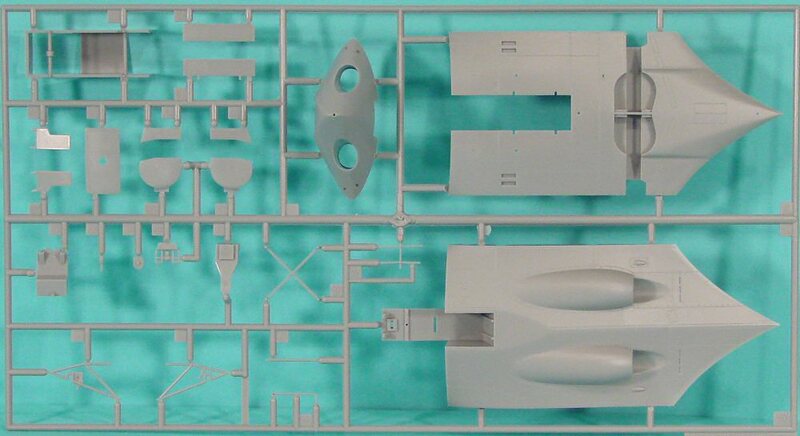 Nevertheless, the kit is still readily available at hobby swaps and on eBay. You may even have one or two of these beauties stashed on your shelf! Dust one of these off and build this unique peek into Luft '46.